Huzzah! 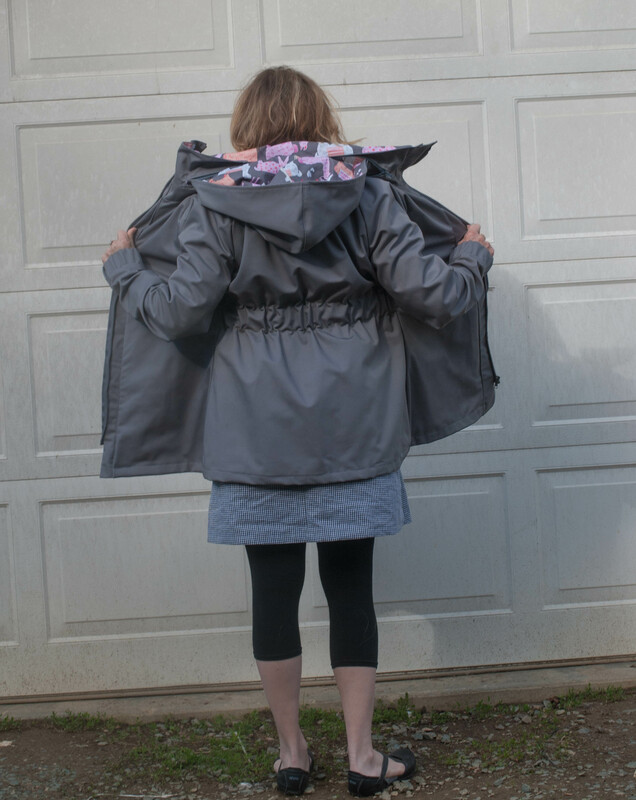 I finished my Minoru rain jacket in time for my trip to Europe! 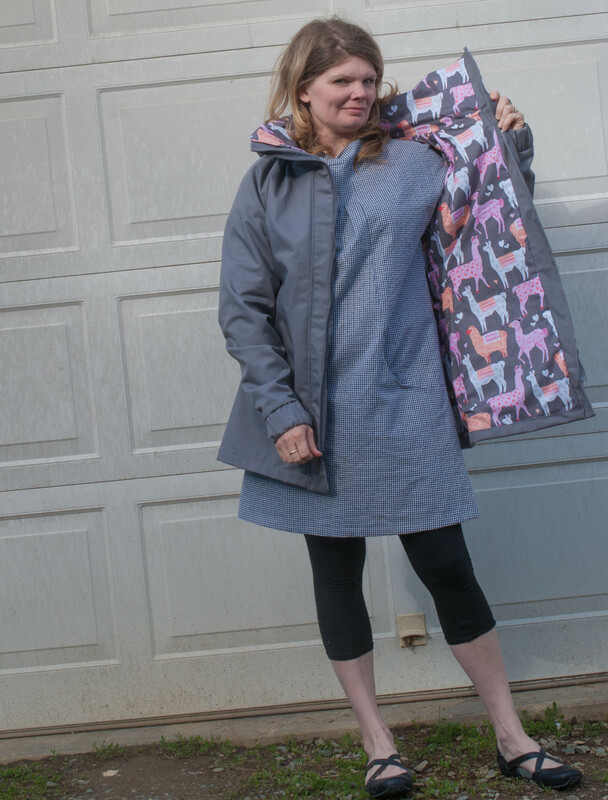 I used regular ol’ cotton twill in grey for the outer portion and a fun Llama print by Michael Miller for the lining. This was the first time I’ve ever made something so complex, and though I had a few hangups, it’s not as remedial as I was afraid it would be. 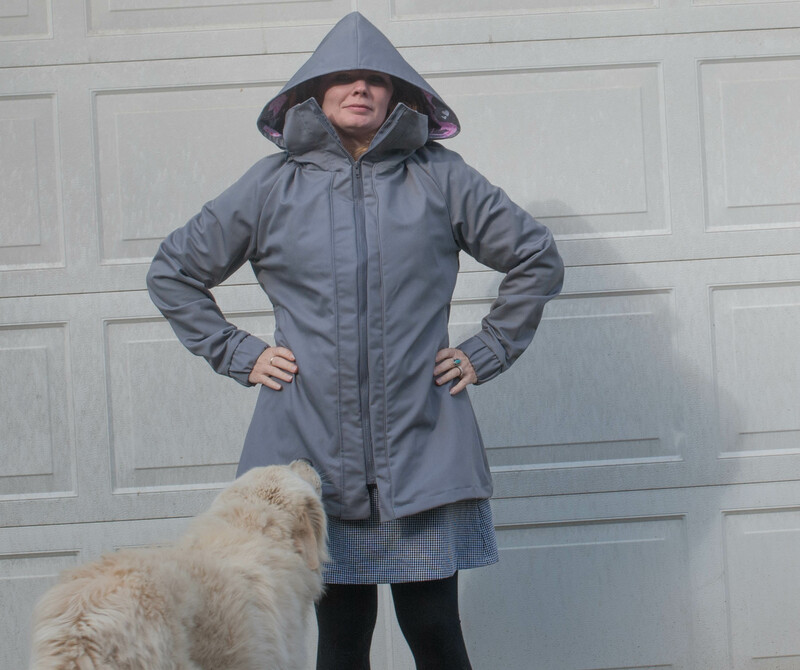 The collar has a handy zipper pocket in the back to store the hood away if you don’t want to use it or leave it hanging off your back. The collar itself is very tall, which I really like. It’ll keep the rain off, for sure. I’ll also be spraying it down with a good water repellent treatment. I also think that next time (oh yes, I’ll make more – it was super fun!) I will make the next size down. It’s just a tad big, and I think I’d like it a bit more fitted. You’ll notice I am also wearing my Sew Lisette Portfolio dress from a few years back. The back has a wide elastic band to cinch in a bit and create a more flattering silhouette. 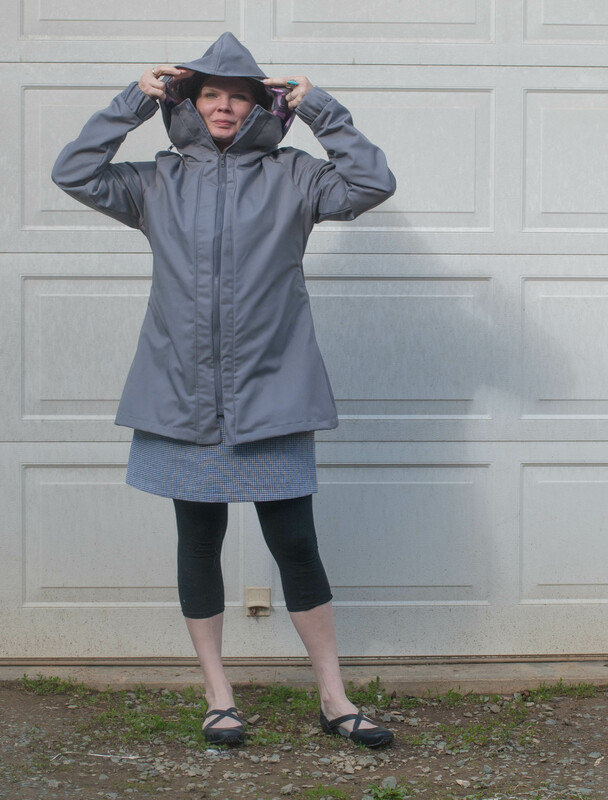 The twill and the lining make it a bit bulky and heavy for just a raincoat, but I wanted a little bit extra warmth, just in case. We’ll be in Edinburgh in the first bit of June and I’m not sure how warm the temps will be. I’m thrilled with it. and I’m feeling well prepared for rainy weather! 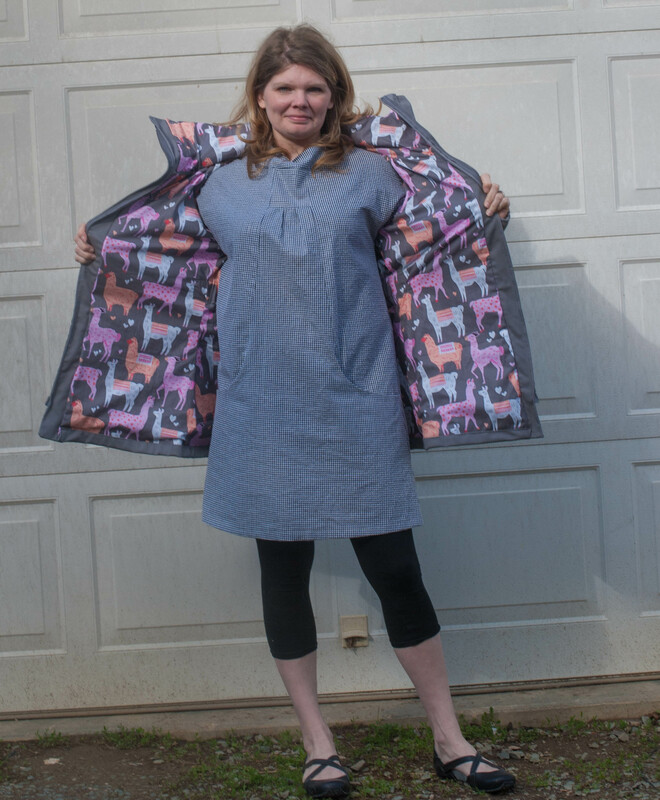 This entry was posted in Uncategorized and tagged Sewing. Bookmark the permalink. Your jacket looks AMAZING on you! You are so so talented 🙂 Your trip is going to be so great! That’s outstanding! What kind of elastic is in the cuffs and back? I think I need one of those. It’s better than what I’ve been wearing for rain. Huzzah, well done. This looks awesome!! Love the lining you used. Such a great piece to have in your wardrobe! Have a great trip! 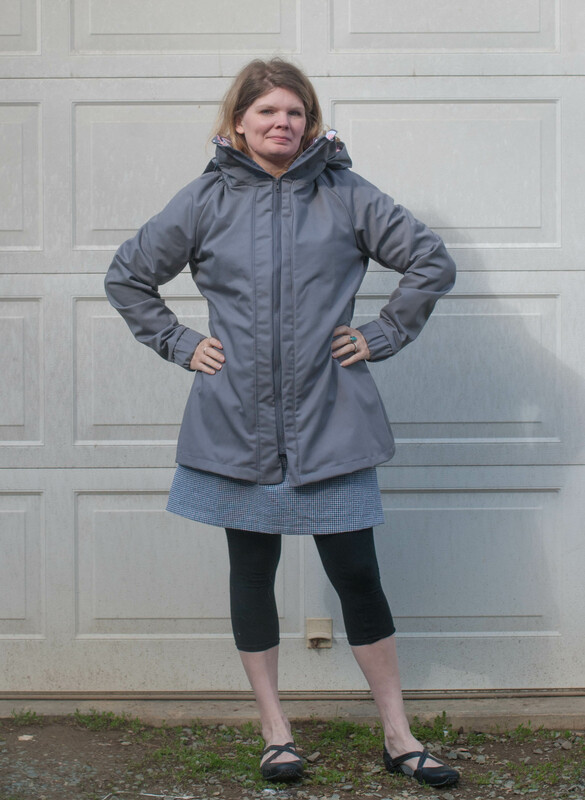 Congrats on attempting a jacket. It looks very professional. I think you might need the extra warmth of lining. My son went to Scotland last year in June on his honeymoon and he said it was chilly and rained. Looks like you will be totally prepared! Completely AWESOME! I think you may be glad to have the extra room come winter. Perfect for a special sweater underneath.